Inequality has risen under Republicans and Democrats when they’ve embraced neoliberalism. The economy is stuck in a ditch, with even Federal Reserve chair Ben Bernanke voicing serious concerns about a double-dip recession. Despite this, the focus of economic policy debates in Washington is drifting dangerously away from fighting mass unemployment and Wall Street hyper-speculation in favor of cutting social spending to reduce the federal deficit. State and local governments throughout the country are imposing major cuts in healthcare, education and social services. This is while the official unemployment rate is 9.6 percent, but a more accurate measure would be close to 20 percent. Also, a high proportion of workers who have been rehired after having been laid off during the recession are taking big pay cuts. All these trends will contribute to worsening the economy’s long-term pattern of sharply rising inequality. Rising inequality, in turn, increases the difficulties of mounting a sustainable recovery. The logic is simple. When the overall amount of income produced in an economy is shared broadly, more people have money in their pockets to spend, which bolsters demand in the markets and encourages private businesses to invest more. This leads to expanding employment opportunities, which then strengthens market demand further. Conversely, when an excessive share of an economy’s overall income is concentrated at the top, then more money gets channeled into the Wall Street casino. This sets the stage for the type of financial collapse we experienced in 2008-09. Just how severe has been the rise in inequality? For starters, the share of total personal income going to the richest 1 percent of earners more than doubled between the late 1950s and 2005, from 10.2 to 21.8 percent. Even more extraordinary, the share received by the richest one out of 1,000 households—the top 0.1 percent—more than tripled over this same period, from 3.2 to 10.9 percent. Of course, capitalist economies are not designed to create equality. They are designed to reward winners in marketplace competition and correspondingly punish losers. This is supposed to be the motor force that drives capitalist economies to produce ever more products and ever greater riches, even if it also generates inequality. But recognizing this central fact about capitalism in general does not explain why US capitalism circa 2010 is producing a much greater level of inequality than during the 1950s and ’60s. The recent book Unequal Democracy: The Political Economy of the New Gilded Age, by distinguished Princeton political scientist Larry Bartels, provides important perspectives on the situation. It does so through the impressive evidence and arguments he assembles but equally through the single overarching consideration that he neglects, even while his data lead us right to this point. Debates have been raging for decades without resolution about the major causes of rising American inequality. Bartels boldly tosses almost all of this literature aside and offers instead his own simple explanation: that the Democratic Party overall supports greater equality and the Republican Party supports greater inequality. 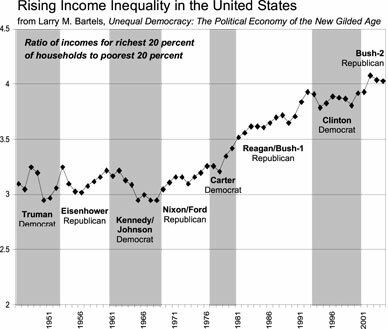 Bartels’s broad explanation for the rise in inequality since the 1960s is thus that Republicans have dominated politics over that period, especially by maintaining control of the White House for most of that time. With Obama in the White House for eighteen months now, and the Democrats holding big majorities in both Houses of Congress, Bartels’s model would suggest that egalitarianism should be on the march. But this has not yet happened. Prospects for the future are at best mixed, with the recession continuing, the healthcare and financial regulation bills having conceded far too much to big business and no action at all having been taken to strengthen workers’ rights to organize and join unions. The evidence Bartels presents in Unequal Democracy goes far in explaining this lack of progress, even though Bartels himself misses the connection. Most telling is a figure in the book that plots the rise of inequality under Democratic and Republican administrations from 1947 to 2005 [see figure below]. The figure shows that overall inequality did not rise by the end of the Republican Eisenhower administration in 1960 relative to when Eisenhower took office in 1953. Moreover, inequality rose under the Democratic presidency of Jimmy Carter at roughly the same sharp rate as it had in the immediately preceding Republican administrations of Nixon and Ford. Finally, considering Bill Clinton’s Democratic presidential term overall, inequality did not fall at all relative to the historically high levels that were attained under Ronald Reagan and the first President Bush. In fact, this figure makes clear that the only period between 1947 and 2005 when America became significantly more equal was during the Kennedy/Johnson years. Because Bartels overlooks this major historical pattern in his own data, he also neglects to observe the dramatic transformation in policy-setting circles undergirding it. This was the shift in policy-setting influence from an ascendant Keynesian social democratic framework to a dominant neoliberal framework, whose intellectual leaders included Milton Friedman and his colleagues from the University of Chicago economics department. This shift occurred in the mid-1970s, during the high inflation years under Jimmy Carter. It was during the Carter presidency that the movement toward deregulating business—including, in particular, global trade and financial markets—began gathering strong momentum. The most significant legislative action to deregulate US financial markets occurred during the Clinton presidency, when most of the remaining features of the 1930s-era Glass-Steagall financial regulatory system were repealed. Bartels is clearly aware of this shift in the broad policy landscape, writing, for example, "When Bill Clinton entered the White House in 1993, he apparently felt a good deal more constrained by the Federal Reserve Board and the bond markets than previous Democratic presidents had been." The lesson is straightforward. Contrary to Bartels, electing Democrats to office will not by itself deliver a more equal society. This includes Democrats such as Barack Obama who openly profess a commitment to "spreading the wealth," as he did during his 2008 election-eve conversation with "Joe the Plumber." The fundamental challenge is, rather, to supplant the continued dominance of neoliberalism in setting the economic policy agenda with an up-to-date variant of a New Deal program. In addition to embracing environmental concerns at its forefront, this green New Deal would be an agenda that pushes the institutions of American capitalism to the limit in allowing democratic politics and egalitarian goals to gain ascendancy over the prerogatives of Wall Street and big business.